Some dishes like puri go well with dry subzis, but for most dishes ranging from rotis to pulaos, a subzi with gravy is the right combo. A subzi with gravy adds a slightly lubricating touch to the meal. So, it helps to include one such subzi in your menu, especially if you are not having dal with the meal. Indian gravies are made of ingredients like tomatoes, onions, cashews and milk. They may be light or rich and creamy. Likewise, the flavour also ranges from slightly sweet to moderately spicy and very spicy. For example, malai gravy will be slightly sweet while one with onions and chillies will be spicy. Once the gravy is made, vegetables, koftas or paneer are added to it to make a tasty main course! 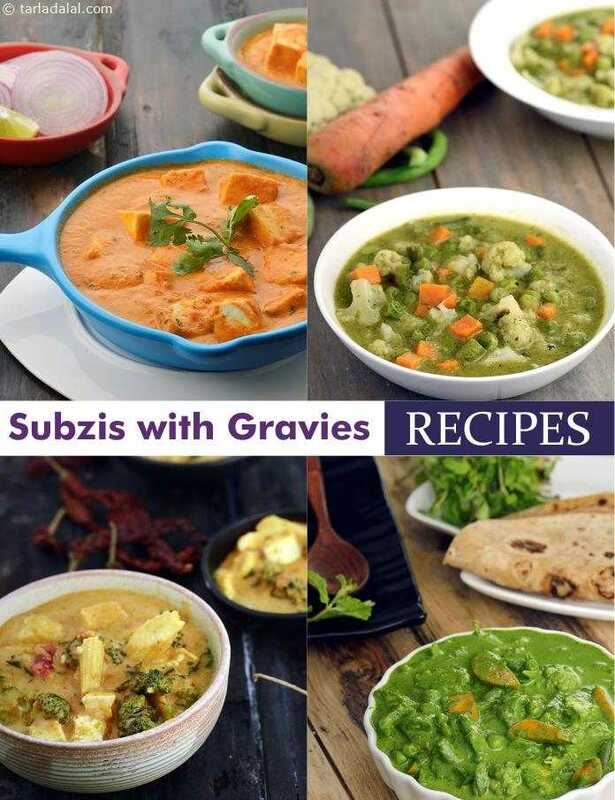 By mixing and matching different gravies with different combinations of veggies and other ingredients, you can come up with an endless variety of subzis. Each region has its own classic gravy and popular veggie combos too. The choice of gravy and veggies might also vary from season to season. For example, in the summer when veggies are costly one might use preserves like wadi in their gravies. Popular all over India, gravy-based subzis can be enjoyed for lunch or dinner along with Indian breads or rice. They are quite filling and ignite the meal with an exciting spark. With the tanginess of tomatoes and the interplay of spices, red gravy is quite versatile. It can be used with most veggies, and is most commonly used to boost the flavour of bland ingredients like cottage cheese or potatoes. Add a splash of colour to your meal with the green gravy. Made of spinach, it is also an interesting way to sneak greens into your diet. The green gravy is usually made with a spinach puree, perked up with spices and other taste enhancers like onion or ginger. It has a pleasant, moderately spicy taste and is a perfect base for koftas, paneer and veggies too. White gravy, as the name suggests is luscious and creamy, often with a slightly sweet tinge. It generally includes ingredients like cashews, coconut and/or cream together with onions for the required pungency. The white gravy goes well with colourful veggies, and the contrast between the gravy and the veggies is very attractive to behold. However, it is very popularly used with paneer and koftas. Whether the gravy gains prominence by the presence of the right breads or vice versa, it doesn’t matter but the fact is that you need to combine the gravies with the right breads to make your main course a success! So, go for one of the following Indian breads that taste really good with gravy-based subzis. When you are free, you can make some basic gravies and store them in the freezer in airtight containers. This makes it easy to conjure up delicious subzis even on the busiest of days! Remove the gravy an hour before cooking. Heat the gravy, toss in some veggies or paneer and your main course is ready. You can do this even for parties. By preparing the gravies beforehand you can save a lot of time, and serve a wider variety at the party without much ado! Armed with the know-how to make different kinds of gravies, you will soon become a master of the main course, because now preparing your main course is just a matter of combining a gravy with the right veggies, koftas, wadis or paneer. The subzis will be so tasty that you will be buried under compliments!